As has happened with other books, particularly where I have some personal connection to their authors, I have come across a published review which says what I would have said (and says it at least as well as I could have said it) and decided that it was better for me to quote excerpts than to write my own review. The quotations below are drawn from the extended review by Tim Elliott for the SMH (you can read it in full here). … Equal parts memoir, coral reef primer and requiem to a planet, [A Life Underwater] charts a career that could scarcely be imagined today, a love affair with science birthed from childhood wonderment, free-range academia and happy accidents. … Veron’s achievements are, quite literally, unprecedented. He was the first to compile a global taxonomy of corals – a monumental task that effectively became the cornerstone for all later learning. He was the first to show that, contrary to received wisdom, the Indo-Philippines archipelago has the world’s greatest diversity of coral, not the Great Barrier Reef. 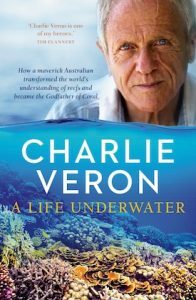 A Life Underwater is a very approachable introduction to reef science since it allows us to learn the science sequentially through Veron’s own journey of discovery. Most of us would benefit from that before tackling his masterly A Reef In Time. Just to enlarge upon that: the conventional model of evolutionary change has always been the ‘tree of life’, branching endlessly from primordial beginnings. That paradigm, however, depends crucially on an assumption that branches never recombine, an assumption which failed so spectacularly with corals as to force Veron to replace it with a model which looks more like a mesh. The best natural analogy for the model I know of (though I’m not sure that Veron has used it) is the ‘braided’ watercourse of (e.g.) Western Queensland’s Channel Country: there is still a clear overall direction but cross-links are common. In the real world, of course, the braiding represents gene flow between species, which has long been known but discounted as exceptional and unworthy of serious attention. A Life Underwater deserves a wide readership, documenting as it does both a fascinating career and an endangered ecosystem of unsurpassed beauty. As for Veron’s warnings on climate change, we had better believe him and do our best to avert the looming catastrophe. Many of us grew up thinking that animals were different species when they couldn’t interbreed. But all sorts of examples have contradicted this, such as the fact our ancestors bred with Neanderthals. So how do scientists classify species? It turns out the answer is not as straightforward as you might think. At last count there were over 30 different species concepts being used by scientists. Ever since humans started naming species there have been arguments about where to draw the line.